Editor's note: Below is an excerpt from Larry King's autobiography, "My Remarkable Journey," published by Weinstein books. Larry King anchors "Larry King Live" at 9 p.m. ET on CNN. 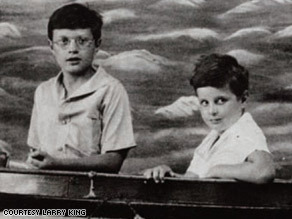 Larry, left, at age 10 with his younger brother, Marty, shortly after their father died. There were three squad cars in front of my apartment building. Flivvers, we called them. I don't remember exactly when I started to hear my mother's screams. But as I hurried up the steps, a cop quickly came down, straight for me. He picked me up and the books went flying. I'm not sure if I knew the cop. But I may have. For years, before the war started and my father went to work in the defense plant, he'd owned a little neighborhood bar and grill. He was friendly with all the cops. The cops loved my father the way they loved any bar owner who had a great sense of humor. I remember having my own police costume when I was very young. A badge and a little nightstick came with it. I'd make like I was walking the beat. Celebrate Larry's remarkable journey with your questions. Send a question today, and you could win a trip to meet Larry in Los Angeles. The cop put me in the squad car. He told me that my father had died. Heart attack. I didn't cry. I remember that. I didn't cry. I was more befuddled than anything else. It must have been difficult for the cop. He started the car and drove. We wound through the streets of Brownsville and ended up at a movie theater. I'll never forget the movie, Bataan, starring Robert Taylor as Sergeant Bill Dane. It was about a bunch of American soldiers trying to stave off the Japanese invasion of the Philippines. Sergeant Dane and his patrol are ordered to blow up a bridge to stop the advancing enemy. They're cut down one by one until only Sergeant Dane and two others remain. The first is killed by a sniper. The second is stabbed by a Japanese soldier who'd been playing dead. The movie ends with Sergeant Dane firing his machine gun straight into the camera at the Japanese soldiers coming at him in one last act of courage and defiance. Larry's new book: "My Remarkable Journey"
I don't remember what it was like when I got home that day. A lot about that day I've blocked out. My younger brother Marty has blocked it out, too. He was only six at the time. But there are a few more memories attached. I didn't go to the funeral. I'd been so close to my father -- yet I refused to go. I stayed at home. There must've been somebody watching me, but I remember being alone. I remember bouncing a spaldeen -- the Spalding rubber ball we used to play stickball -- off the front stoop. Two other things I can tell you for sure. I never went back to that library again, and from that day on I was nervous if I saw a squad car in my neighborhood. If one parked by my apartment building, I'd start running home, in fear that my mother had died.